Betsy DeVos and the Trump administration have made no secret of their support of for-profit colleges. Today, they’re taking the next step to cut regulations for such controversial programs, Politico reports. According to the report, DeVos will do away with an Obama administration rule. Education Secretary Betsy DeVos moved Thursday to eliminate Obama-era regulations that were meant to cut off federal funding to low-performing programs at for-profit schools and other career colleges. The Education Department unveiled a proposal to rescind the “gainful employment” regulation, which was a centerpiece of the Obama administration’s crackdown on for-profit education companies. The goal of the rule, which took effect in 2015, was to make sure that students who graduate from for-profit schools or other career-oriented programs make enough money to repay their student loans. But the schools, and congressional Republicans, have long criticized the regulation as unfair and overly burdensome. DeVos’ proposal to kill the regulation goes further than other draft plans circulated by the Trump administration. Previous proposals would have gutted the penalties associated with the rule, but they would have kept mandatory consumer disclosures by colleges to prospective students. The Trump administration said it plans to update the Education Department’s College Scorecard website with expanded data about the outcomes of students who attend all colleges and universities receiving federal aid. The department plans to calculate and publish the earnings and debt levels of graduates broken down by individual academic programs. The Scorecard website is not required by any law or regulation, so the Trump administration’s promise to expand the data published on it isn’t binding on the department. 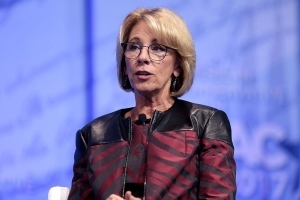 Consumer groups and Democrats have already sharply criticized the Trump administration’s plan to repeal the rule as a giveaway to the for-profit college industry. They say they’re worried DeVos’ plan will open up billions of taxpayer dollars to low-performing colleges. Democratic attorneys general from 17 states and the District of Columbia are suingDeVos over her previous delays in enforcing the “gainful employment” rule. The Education Department said it would accept public comments on the proposed elimination of the regulation for 30 days. The department must publish a final regulation by Nov. 1 for it to take effect in July 2019.